When we first met alto sax player Jimmy Preston back in November we made note that Preston’s inclusion in rock ‘n’ roll, while certainly not undeserving, was somewhat fortuitous. Already in his 30’s and little more than a local draw around Pennsylvania with no recording experience, he benefitted greatly from the fact that throughout 1948 the songs which made the most noise, literally as well as figuratively, on the Race Charts had been sax-based rock instrumentals. As the recording ban which had prevented new songs from being cut for most of that year was easing, soon to be settled officially before 1948 came to a close, independent record labels had been in a mad rush to find suitable players not under contract elsewhere to jump into the studio and give it their best shot in an effort to strike while the iron was hot and hope to come away with some sales to keep their labels from going under. Thus the bespectacled unassuming looking Preston was afforded an opportunity that soon would be all but extinct for older not quite established artists such as himself to attempt to ply his trade in a field that was skewing ever younger and ever more cutting edge. The old musical motifs were crumbling in this rough and tumble new frontier and it was unlikely that those outside of its boundaries once it had gotten its footing would be able to make the transition. Jimmy Preston was one of the exceptions. But of course we didn’t know that yet. His initial foray into the realm, Messin’ With Preston, was serviceable in that it made no stylistic missteps that would trip him up and cause him to be expelled from the ranks of rock’s growing sax brigade, but it was rather modest in its intent all the same. No crazed honker was he, instead Jimmy Preston tried winning you over by means of melodic persuasion. If you’re prone to asking whether he reasonably succeeded in the attempt without going back to read the review for yourself, well the answer should be obvious – that he’s still here means it did work… to a degree. But just remaining in the roll call of artists isn’t quite the same as being at the front of the line for stardom. After a year which saw its ranks being artificially kept low thanks to said recording ban, now the floodgates were open and there’d be a torrent of new, young, ambitious artists clamoring for the audience’s attention. We’ve seen it already with the likes of Big Jay McNeely taking the sax instrumental to new heights, then immediately following it up by taking it higher still, further evidence that rock was shaping up to be a world in which musical progress was charted by days, not years. For Jimmy Preston being modestly effective in his more restrained pursuits wouldn’t cut it for long. There was one thing however that had the potential to stand Preston apart from his competitors in that arena, for unlike most sax players he wasn’t limited to instrumentals. Preston sang too. Though a passable saxophonist, as an alto player he was going to find it tough to compete with the more rough hewn tenors that dominated the field, and so for long term solvency he may have been slightly more suited to rock as a vocalist. Make no mistake, he was by no means a singer to compete with the best rock had to offer. Forget about the dazzling voices of Roy Brown, Andrew Tibbs and Jimmy Ricks, whose pipes were made of pure gold, and similarly you can cast aside any thoughts that he had the versatility to match Amos Milburn, the power to approach Wynonie Harris or Big Joe Turner, or the delicate fragility of Sonny Til and Maithe Marshall. No. He had none of their specific skills, not even close. But what he did have was a durable somewhat flexible voice with solid tone, able to credibly convey the types of storylines rock thrived on. A voice that could convince you he wasn’t telling a tale heard second hand, but one he’d witnessed himself, perhaps even took part in. That authenticity was proving to be a determining factor in selling the increasingly astute rock fan a bill of goods. The listener instinctively knew who to believe when it came to having the experience necessary to put across these slices of life from the other side of the tracks and Preston, even though he sure didn’t look it, had what it took in that regard. When it came to believability such a trustworthy voice did him well with Numbers Blues. For those who are blissfully unaware of the seedier side of life, the numbers racket was one of the unfortunate social leeches of the black community for much of the 20th century. 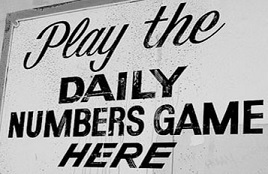 It was a simplistic gambling system that infiltrated small neighborhood stores, barber shops and newsstands in which people would place their bet and choose their numbers for a later drawing and the payoffs for those who hit would of course seem big, but it was but a drop in the bucket compared to all the money that had been collected. As with all gambling – large or small – the odds are always with the house, otherwise the syndicate wouldn’t be in business and for a community that could ill afford it the costs over the years were sizable. Rather than saving and investing money and being assured of watching it grow, slowly but surely, the working class put their faith in a system that was designed to rob them blind with the hollow promise that they MIGHT hit it big. Few, if any, did, thereby guaranteeing that most would never escape the financial straits they started in. Oh yeah, just so I can fulfill my annual public service announcement quota, the state run lottery is the exact same scam, only officially sanctioned. Those playing are precisely the type of sucker the numbers rackets thrived on. Some things never change. Now back to our regularly scheduled programming, already in progress. One of the more underrated aspects of being a recording artist, especially one called upon to cut songs they didn’t write, is being able to showcase the proper qualities for the job at hand. We’ve already touched upon the need to make the lyrics sound authentic, but there’s also the corresponding need to place those lyrics in a musical framework that fits the mood they need to convey and here on Numbers Blues Preston and company do just that. Again it’s nothing that’s going to grab you by the collar and shake you down to your boots, but it’s also not supposed to be. The serpentine horn line that opens the song lends the right amount of intrigue to the production. Sounding like it’s meandering about before you realizing that it’s pulling you into the thickets where something is about to be sprung on you. When Preston drops his horn and starts to sing his approach is confessional, but not in a pious sort of way. He’s bemoaning his fate to his brethren down at the barber shop, or on the corner, decrying the state he’s in because of his ongoing bad choices when it comes to taking care of his finances vis a vis laying it down on the numbers rather than putting it in a piggy bank, under the mattress or in his wife’s firm clutches. The song was written by that purveyor of all that’s sinful in early rock, Rudolph Toombs, an expert in the field of drink, dames and dollars lost by untoward means. He details the particulars of the “game” in ways that anybody whose paycheck winds up in the numbers runner’s hand knows all too well. The high hopes, the delusional self-assurances that your methods are foolproof, the dismay and incomprehensible shock at finding out you’re broke again, and even the reliance on other empty-headed beliefs – in the case the typically confident fortune teller that contributes to his downward financial spiral – that all too many of the victims of this crime fall prey to. Preston sells it all with the conviction of someone who’s been down that same path himself all too often. His world-weary tone is spot-on, his hopes rising and subsequently falling with each plot twist delivered. His phrasing suggests an intimate familiarity with the game’s particulars, not merely reciting lines that in the common everyday vernacular make little sense, but rather understanding what they mean before the payoff arrives to let the rest of the audience without that first-hand experience know as well. The music is largely unobtrusive after the strong opening, but appropriate all the same, sort of acting as a discreet accomplice in all of the bad deals going down, not wanting to draw undue attention to its presence while still collaborating on the underhanded acts in the shadows. All of that probably has you thinking that Numbers Blues marks Preston’s breakthrough into the big time, or at least should have propelled him to stardom or something just shy of it. But that’s not quite the case. While the performance hits all of the right notes, musically, vocally, even on aspects out of his hands, such as lyrically, there’s not enough OOMPH in it to carry it into the upper reaches of the rock standings just yet. It does everything its called on to do, but it’s not aiming at the top rung of the ladder. This is a record that has more limited aspirations. It’d make for a first rate album cut were this not the era before albums. On the B-side of a Top Ten hit this would be a most welcome bonus, a cherished flip-side to a storming instrumental where it would serve as a nice compliment and showcase his diversity. But in terms of A-sides of records by an artist still looking to make a name for himself it can’t help but come off as slightly underwhelming. A good effort rather than a great record. That’s always the final piece to the puzzle of a career – does a record further the artist’s agenda at that specific time? It does here somewhat, but right now he needed more than a “somewhat”. He needed a HIT and this, solid though it may be, had little chance to achieve that outcome and almost no chance at being a smash. But that said I can’t find fault with it in any of its specific attributes and have no reservations about recommending it. The record itself is of high quality in every regard and Toombs composition is accurately drawn and enjoyable in its details. It even marks Preston as someone to watch going forward, proving that he can handle different types of material other than just the sax instrumental role he may have been shaping up to be otherwise. Gotham Records should be commended as well for letting him tackle something like this in the first place and knowing that it fits in with the persona that he’ll need to master in order to carve his place in the rock community. But at this stage, when the goal is to claw your way to the top of the rock ‘n’ roll heap, small advances like this, solid records, GOOD records, but records that don’t seize your attention and demand to be heard again and again, aren’t going to vault you much higher on the depth chart, especially when more and more artists are joining the fray all the time. For Jimmy Preston, an unlikely figure in rock ‘n’ roll to begin with, being good… even above average… is not quite good enough. Not yet anyway. Yes, it’s a record that in 2017 can be looked back on fondly, listened to with pleasure and enjoyed for what it is. But in 1949 with his career needing a jolt to ensure he stuck around long enough to qualify for a pension, Jimmy Preston needed something just a bit more transcendent than this. Leave a reply on "Jimmy Preston: “Numbers Blues”"